I’ll be the first to admit that I’m biased when it comes to this film. In 2009, I experienced my first ever relationship. I also experienced a breakup from said relationship in the same year. Consequently, I can relate to the main character, Tom (Joseph Gordon-Levitt), and his rise and fall brought about by Summer (Zooey Deschanel). Like Tom, I too held the romantic belief of “the one,” based mostly on the movies, books, TV shows, and music that touted this magical someone who would fill the hole in our souls. What (500) Days of Summer emphasizes is certainly closer to reality: not every story has a happy ending. As for the way the movie is presented, I must applaud the ingenious and artful direction of Marc Webb, this being his directorial debut after years of working on music videos. His previous experience certainly comes through in the music chosen for the film, as well as some of the cinematography to go along with said music. Jumping around the timeline of the 500 days, this film’s fractured storyline helps to show the contrast between the “honeymoon phase” and the downward spiral that leads to a breakup. My favorite sequence in the film was the “Expectation/Reality” split screen since it was by far the most accurate representation of many of my personal experiences. As a male, I know women can be confusing, but the ambiguity of the relationship in this movie made the vagueness of Summer especially heartbreaking for Tom. Watching this movie again, years later, I appreciated how the personal growth and moment of courage for Tom were the positive results of his failed relationship. The fact that relationships don’t turn out the way we think is probably why I also truly enjoyed La La Land (2016) as well. 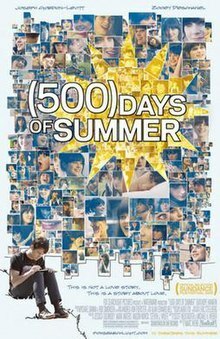 An adorable film with some valid points about relationships, I give (500) Days of Summer 5.0 stars out of 5.